If you want to climb ice, you're going to need a pair of ice axes. The state-of-the-art is this carbon pair from Black Diamond, which will run you a cool $340/£228 per axe. Or, you could just make your own, like this guy did, saving himself over 500 grams in the process. 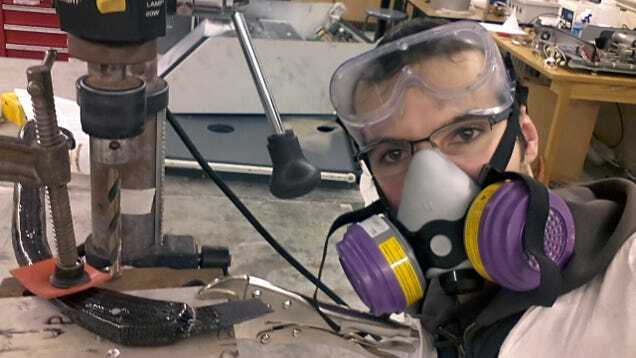 Nils Cuinat-Guerraz is a composite materials researcher at Canada's McGill University. He also doesn't have £456 to drop on a pair of carbon-fibre axes, so when he got into ice climbing, he set out to build his own. The first step for DIYing ice axes is to decide on a shape. 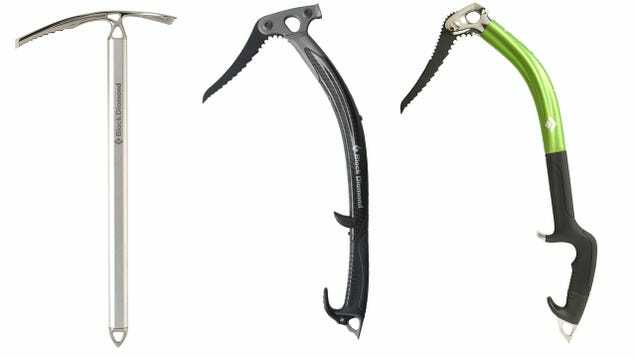 The geometry of an ice axe is hugely important, completely changing the way the tool feels and works. A walking axe (above, left), where the pick is only going to be used for self-arrest, has a very shallow pick angle (the angle the pick sits at relative to the handle). A mixed-climbing axe, like the BD Fusion (above, right), has a steep pick angle, with a steep ice tool sitting somewhere in the middle. 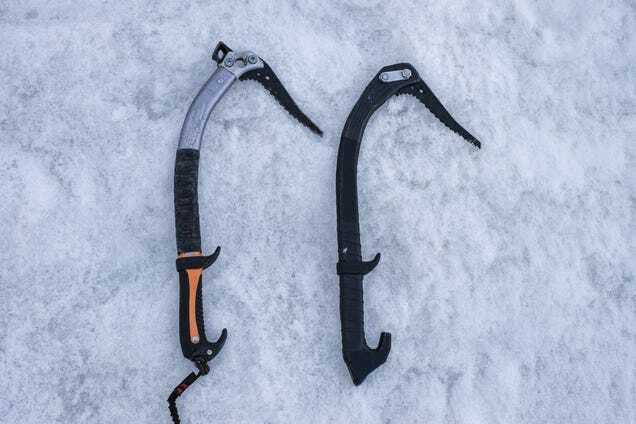 When an outdoors company designs an ice axe, working out the geometry — pick angle, handle, tool length, shaft curve and all — is one of the hardest parts. According to Bill Belcourt, the head of R&D at Black Diamond, the team starts out with a set of goals for a project, like "make an axe that's under a pound but strong enough to climb ice," and then tries out 15-20 concept designs in the lab and in the field, to see what works. Without being able to prototype different shapes, Nils stuck to a tried-and-tested design, in this case taking the shape from Petzl's successful Quark tool, and copying it wholesale in carbon fibre. This also let him use standard Petzl picks and finger-rests, instead of trying to mill his own. Once he'd settled on a shape, it was on to a computer to test out the strength. Finite element modelling (FEM) is basically computerised stress testing, allowing engineers to apply different loads and forces to a model, see what breaks as a result, and then (hopefully) fixing the problem. Computer testing done, and with a basic idea of construction in hand, Nils moved onto the first prototype. To make his carbon-fibre axe, he was using a process called Vacuum-Assist Resin Transfer Moulding (VARTM). Basically, it involves making a rigid mould, in this case out of foam, with the end shape you want to achieve. Then, carbon fibre is wrapped around the outside. In this case, Nils used three layers of a carbon-fibre 'sock', each with a different weave patterns to achieve better overall strength across multiple directions. Then, the carbon-wrapped mould is covered with resin, and placed in a vacuum bag, which uses pressure to impregnate the carbon-fibre with the resin, resulting in the super-light, super-rigid carbon-fibre structure. 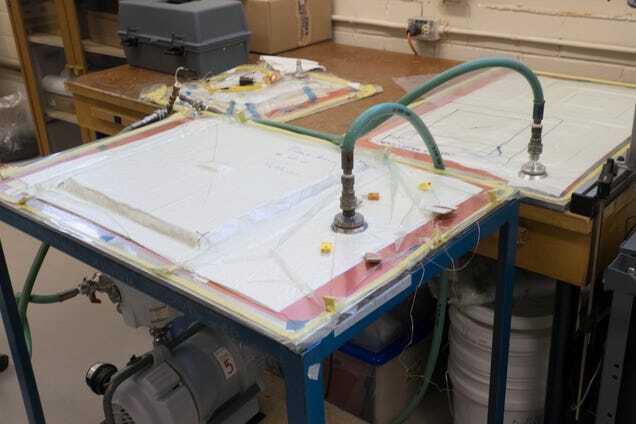 The process is relatively cheap and easy — you don't need much more machinery than a vacuum bag and the carbon fibre itself (the expensive part). But it's a slow process, and one that can lead to imperfections in the final product. It's also difficult to make intricate shapes or designs. So, when making carbon-fibre tools for customers, Black Diamond uses Resin-Transfer Moulding, a similar idea with different execution. Carbon-fibre is packed into a steel mould, and then an air bladder inserted into the middle and inflated, which pushes the carbon-fibre (and resin) into the steel mould with a high level of precision. It's a much more accurate process — BD's ice tools are laid-up with 54 different pieces of carbon-fibre, as opposed to Nils' three — but involves much more expensive and complicated machinery. 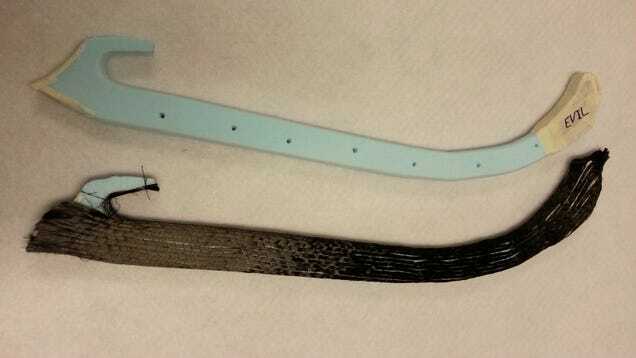 Another big difference between home DIYers and real companies is the level of testing. Belcourt told me Black Diamond goes through hundreds of axes in lab stress tests, plus any ice axe sold in shops is certified by the UIAA, which does its own series of tests. All credit to Nils, he tried to replicate the main strength-test on an ice-axe shaft: fixing the ends, applying a weight in the middle, and trying to break it. Commercial axes need to withstand 2kN to pass the basic rating, and 4kN for a technical tool. Nils pull-tested his first prototype at about 1.4kN (although he thinks his final models would probably go to around 3). Once Nils had two carbon-fibre shafts, he just had to drill holes in the head for a pick, wrap the handle with grip tape, and he had something you can actually climb on. I've taken them up a few of the (rapidly-melting) waterfalls in Quebec, and they're surprisingly OK to climb on. Even compared to Black Diamond's carbon-fibre Cobras (588 grams a piece), they're stupidly light at 320g (probably owing to the lack of a metal head). That makes them a little hard to get into the ice, since there's very little momentum when you swing; but on the plus side, your arms get less tired. And, Nils reckon's he spent only about $200/£134 making them, although having access to McGill's lab obviously helped there. Either way, you'd be crazy to take them on a serious climb. After talking to Bill Belcourt, I got a healthy dose of respect for the time, effort and science that goes into making their carbon-fibre tools. 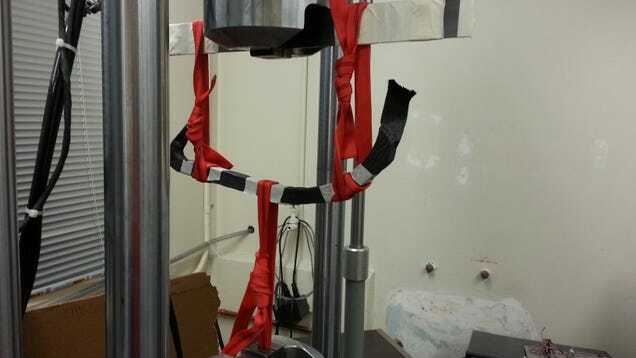 The Cobras have been decades in the making, and took years of R&D (plus some major scientific breakthroughs by the mountain-biking industry) to make a tool that passed their testing. Ice climbing is a dangerous enough sport already: you probably want to be holding your life from a well-designed, thoroughly-tested tool than what you can make in your own garage. Better get saving.